Another week, another restaurant. Having failed to make it to The Wounded Goose on a previous attempt, and with a day of good flying weather laid out for us like an expansive buffet, we decided to try again, albeit with an earlier arrival time that would hopefully find the airport courtesy car sitting there waiting for us. As this trip would involve landing at Gallipolis, and with trainee John having expressed great interest in flying again, and as he grew up in Gallipolis, well, I thought this would be a great trip for him to ride along on. We agreed to meet at the hangar at 8:00 in the morning and try to be in the air by 8:30. I wanted to set aside enough time for a leisurely preflight, and my having mistaken late April as a temperate month, get there early enough for the oil preheater to get at least a little heat in the 26 degree oil. The preflight and subsequent departure went off without a hitch. The air at our cruising altitude was glass smooth, so I went against my normal policy of me flying the easy leg and letting the guest wrestle with the afternoon bumpiness and let John fly us down south. He again did a simple amazing job of it. He says he's still a little overwhelmed and hasn't yet developed a comfortable scan of the goings-on outside the windows balanced with the plethora of gauges and dials on the Dynon, but I couldn't tell. The autopilot couldn't have given us a smoother ride. We made use of the easy flying conditions to work on his comprehension of how the round gauges and needles indicated both our direction through the air and our track across the ground. The concept that those are not always the same thing takes awhile to internalize, and the depiction on the screen also takes some time to fully understand. I just took a few comparisons with the GPS ground track versus something fixed on the ground such as roads or railroad tracks to clear that up. His big sticking point right now is figuring out pattern entries. That's no surprise; there are licensed, experienced pilots that sometimes seem weak on the subject. It's fairly complicated. As I was explaining the way the shared unicom frequencies work as pilots self-announce their positions and intentions, I couldn't help getting up on the high horse I ride when it comes to the subject of people that 1) wait until the last minute to dial up the unicom frequency and then just ask everyone in or near the pattern to bring them up to speed, or 2) don't talk to or respond to other planes in the pattern; they figure telling us where they are is enough and we can just work around them. The winds were calm, too, which gave me occasion to explain the dangers of a calm wind day with regards to uncontrolled airports. With no wind to indicate the preferred runway, it's anyone's guess as to what other pilots are going to decide. As we were coming from the north and the runway is oriented northeast - southwest, a midfield entry into a left downwind for runway five suited us the best. I told John that we were going to announce "Gallia-Meigs traffic, Experimental two eight four delta golf is eight miles north, inbound left traffic runway five," but that it was pretty unlikely that there would be anyone there to hear it. "Experimental approaching Gallia-Meigs, we use runway two three when the winds are calm, we're running up for departure on two three, and a NORDO Champ just departed two three." "Okay, four delta golf will make a midfield crosswind to the left downwind, runway two three." That exchange turned out to be a perfectly timed lesson on the subject of how it should be done. The guy in the Cessna getting ready to depart did everything he could do to make sure everyone knew what was going on. Kyle arrived a quarter hour later and we loaded up in the courtesy car for our trip to nearby Bidwell, home of The Wounded Goose, a car towing business, and nothing else at all. Seriously, I could come up with dozens of those. Once inside, I noticed a Chinese restaurant cat in hiding. They even have their own glassware. It was a surprisingly nice place. The special was a cheeseburger made from local Ohio beef, and it was incredibly good! The fries and chips are homemade. After lunch, we stopped by at a local gun store. I want one. 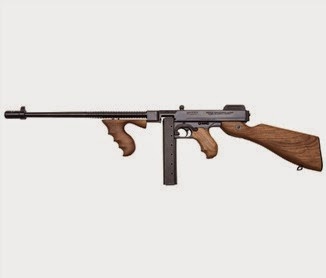 It's $1,200, but I WANT ONE! 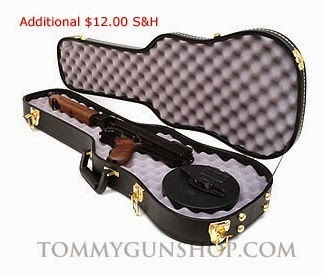 And they not only sell a variant with the drum magazine, but they also sell a violin case to carry it in! As Kyle said, all we would need is Fedoras, and I happen to already have one! We stopped by Jackson, where Kyle helped me with tightening the nut that provides resistance to the swiveling of the nosewheel. I've been getting what feels like a shimmy on landing - I had hoped the tighter nut would help. I'm starting to think that I was right in the first place when I thought I had damaged the wheel bearing again. I have one in stock, so I'll likely just swap out the old for the new and see if that helps. The killdeer is a medium-sized plover. The adults have a brown back and wings, a white belly, and a white breast with two black bands. The rump is tawny orange. The face and cap are brown with a white forehead. The eyering is orange-red. The chicks are patterned almost identically to the adults, and are precocial — able to move around immediately after hatching. The killdeer frequently uses a "broken wing act" to distract predators from the nest. The range of the killdeer spreads across the Western Hemisphere. In the summer, killdeer live as far north as the Canadian provinces of British Columbia, Alberta, the Yukon and Quebec, as well as the southern parts of the U.S. state of Alaska. Killdeer hold a year-round presence across the southern half of the United States and parts of Peru. The killdeer winters throughout Central America. Although killdeer are considered shorebirds, they often live far from water. They live in grassland habitats such as fields, meadows, and pastures. The nest itself is merely a shallow depression or bowl in the ground, fringed by some stones and blades of grass. The nest is well camouflaged, as the spots of the eggs disguise them as stones, and the simple structure of the nest resembles its surroundings. Distraction displays, also known as deflection display, diversionary display or paratrepsis, are anti-predator behaviours used to attract the attention of an enemy away from an object, typically the nest or young, that is being protected. They are particularly well known in birds but noted also in fish. Distraction displays are, however, not very well defined and the definition has been the subject of much debate. They are sometimes classed more generically under "nest protection behaviours" along with aggressive displays such as mobbing. It has been suggested that distraction displays exist mainly in birds, since they have the ability to escape at the last moment out of reach of ground predators. Displays are used mainly for ground predators, and are rarely used against avian predators. False brooding is an approach used by plovers. The bird moves away from the nest site and crouches on the ground so as to appear to be sitting at a nest and allows the predator to approach close before escaping. Injury feigning is one of the more common forms of distraction. The broken-wing display is particularly well known in nesting waders and plovers and doves such as the mourning dove. Birds that are at the nest walk away from the nest with one wing hung low and dragging on the ground so as to appear as an easy target for a predator. Well, there ya go. Learn something new every day, and something actually useful on a semi-monthly basis.